One of the ways that many of us seek to fill a funding gap in our own personal economies is through the help of loans. Whether you are making a big purchase, like a home, with the help of a loan, or getting a smaller loan for something like a car, sometimes we feel as though borrowing is a necessity. But what about some of the smaller purchases? Perhaps you are hoping to have a small personal line of credit that you can fall back on in the even that your variable income is affected, or for some other reason. A personal loan from your bank can provide you with the funding you are looking for, and can, in some cases, come with a lower interest rate than what you would receive with a credit card. With peer to peer lending services, such as Prosper, alternative low interest funding sources. It’s possible to receive an unsecured loan from your financial institution. This loan is not like a home equity loan, which is secured by your property. It is unsecured, like a credit card (but it’s not a credit card). Many banks offer installment loans of between $1,500 and $10,000. These installment loans are paid back within a specific time period. You make regular payments, as agreed, until the loan is discharged. Another possibility is a line of credit. A personal line of credit is a revolving debt. This means you are given a limit, and you can keep borrowing until you reach that limit. As you make payments, the money becomes available again. Depending on your income and your credit score, you can receive approval for a large personal line of credit. Some financial institutions even issue you a card that you can use when accessing your line of credit. Find out what your bank offers in terms of personal loans, and decide which makes the most sense for you. You might be able to get a better interest rate on a personal installment loan, but a personal line of credit might have more flexibility. As with all things credit and debt, your credit situation is one of the most important aspects of whether or not you will be approved for a personal loan, as well as what terms you will receive. Your payment history and credit utilization, along with other factors that make up your score, will be considered. A good credit score means that you will be approved, and probably for a higher amount. On top of that, your good credit can mean a more favorable interest rate. For some smaller loans, it might not matter if you pay a little higher interest rate — if you are going to pay off your loan quickly. If you want to lower the interest rate further, you can offer some collateral. Any loan that is secured with something valuable will have a lower interest rate than an unsecured loan. Find out what documentation you need for your personal loan. Some banks don’t require a great deal of documentation for a personal line of credit. My bank simply asked for information on my home loan, as well as my income, and then ran a credit check. I didn’t have to back up any of the information with tax documents or pay stubs. However, I do have a business account and a personal checking account with the bank, and that probably made a difference. Other banks may require documentation of your income, as well as access to your credit report and credit score. Before you go in, call the bank and find out what is required. That way you will be prepared. While you might be able to get the best terms from your current financial institution, this isn’t always the case. Some banks don’t even offer unsecured personal loans. Call three or four different banks and credit unions to find out what is available, and to compare terms. It helps to have an idea of where you stand before you start comparison shopping, so check your credit report and score so that you have a better idea of what to tell representatives when you call around. You want to have correct information so that the quotes you receive are as accurate as possible. 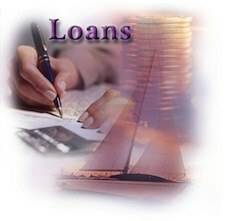 A personal loan is a little harder to get from a bank than some of the other loans out there, including credit cards. However, your interest rate is likely to be a little bit lower, and if you can qualify for a personal loan, it can be an advantage to you.